This entry was posted in Anolis carolinensis, Green Anole, Uncategorized and tagged Biodiversity, Wednesday Vignette by Tina. Bookmark the permalink. Those are my favorite little lizards. This has been a very good year for lizards and my garden is full of green and brown anoles and skinks. It seems I send them scattering with every step. They’re my favorits too! Who doesn’t grin when one scampers by? You’re lucky to have skinks–they’ve never been in my garden. Adorable little guy (gal?). I read somewhere we interpret lizards as kind of “glaring” because they don’t have eyelashes or eyebrows. Which made me laugh, because can you imagine an anole staring at you with one raised brow? That’s interesting about the no-eyebrow-glaring-look thing. It makes sense though. I can totally imagine one (or most) of them raising their eyebrows at me. Lizards are so sweet. I love anoles, but do not have any in my garden. Lucky you. I like lizards too. I’m sorry you don’t have any anoles, they’re lots of fun in the garden. Aww, what a sweetie! I wish I had lizards in my garden… Maybe if I’m successful with this year’s attempt with frogs, they will come. To my knowledge, the tadpoles I raised last spring didn’t decide to stay in my garden. At least I haven’t heard any of their song, so I assume they moved on. So, I’m giving it another try this spring. Fingers crossed! He or she is cute! I’m sorry you don’t have any lizards. Is your climate just too chilly for them? I hear tree frogs in my garden during spring and early summer at night, but I’ve never seen one–they always pipe down as soon as I walk near by. Good luck on attracting frogs, I hope it works. I love anoles, and I’m jealous because we don’t have them here in the north. I always enjoy seeing them during trips to Florida and other points south. We’ve had a few migratory birds, but the big rush for us usually happens in early May. Happy spring! They’re charming garden buddies–I love’em too! Anole males have a red dewlap beneath their jaw that they can display as a territorial marker or to compete for a female. In our local species the extended dewlap is red and contrasts with the green body. Yes, you see that a lot this time of year! That’s an incredible shot–thanks for the link. I saw a couple of them locked in non-mortal combat about a week ago. I’ll have a post about those two miscreants in the near future. 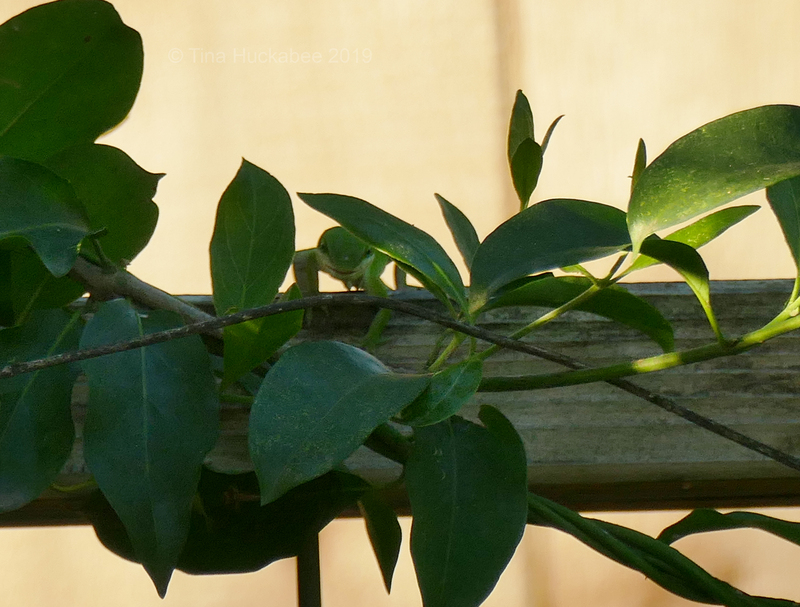 I’ve seen more green anoles this year than in the recent past. We’ve had such an invasion of the brown that I really feared the days of the green were over. When I was leaving this morning, I counted 17 brown anoles of all sizes — some only two inches long — on a rock wall. But I’ve seen the green on my window screens the past couple of weeks — three floors up! — and they’ve been roaming around the bushes at ground level. I’m really happy to see them; they’re cute as can be. Wow–17? That’s amazing. I have a little crew who hang out along the front of my house, hiding/living behind our window shudders and in the attached garden. My cats love to watch them from inside the house: cat on one side of the window/screen, lizard on the other. They really are as cute as can be! 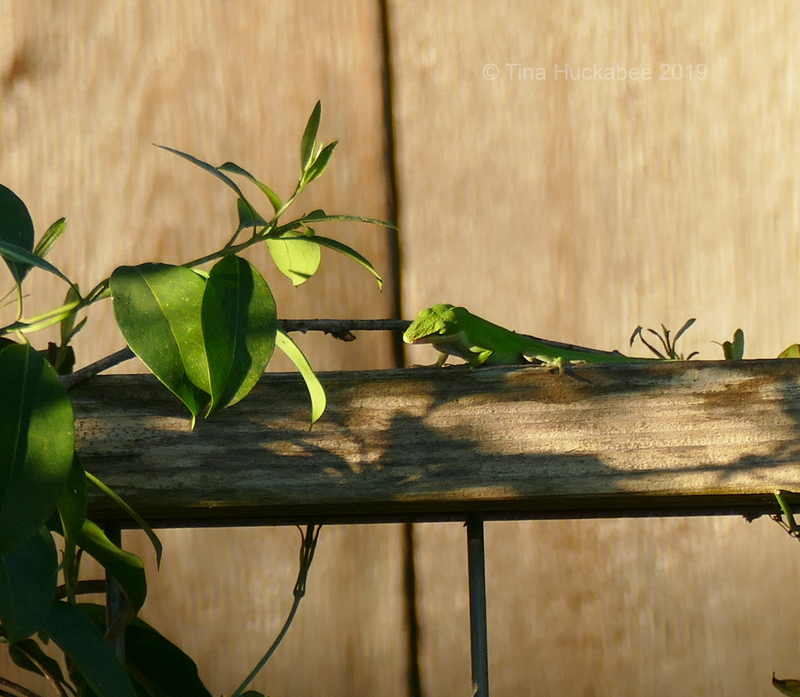 I love anoles in my garden! Lucky you! I do feel lucky to share my space with these cuties. Or, are they sharing their space with me?? Nice catch! Cute little guy. Love these little guys! Great photo…they’re fast.